The popular Atlantis Gala Dinner is back… and wait ’til you see what’s coming! From 2-metre-high caviar fountains to a massive buffet-style banquet, this bash is as over-the-top as they come. Your evening will kick off with canapés, champagne and welcome drinks, followed by a luxury buffet with free-flowing premium beverages all night. But that’s not all… a 30-piece live band will also be performing until 3am so be sure to bring your dancing shoes! Want to make a serious ‘splash’ on NYE?! Why not ring in the new year by dining in an underwater restaurant! Celebrate the start of 2019 at Ossiano and enjoy an impressive ‘Spherification’ five-course set menu created by award-winning chef Gregoire Berger (trust us… he’s a culinary genius!) We’re talking foie gras beignet, king crab, a langoustine tart with Kristal caviar and more! Did we mention there will be a live band too?! Ring in the new year at the super stylish and intimate restaurant, Hakkasan Dubai. This award-winning hotspot serves up incredible Cantonese cuisine and is also home to a lively bar where you can kick back with amazing drink creations. There will even be a DJ to keep the party vibes going late into the night, so come down if you’re in the mood for something classy, trendy and oh-so fun. The world-famous Nobu Dubai is inviting you down for an unforgettable New Year’s eight-course menu! From lobster sashimi and caviar de sologne to king crab tempura and slow-cooked sea bass, this NYE experience was made for the city’s seafood lovers. If you’re a serious foodie looking for seriously fun party vibes, we can’t think of a better place on the Palm to welcome 2019. A DJ will also be there on the night spinning the hottest tunes, so get ready to dance your way into the new year! 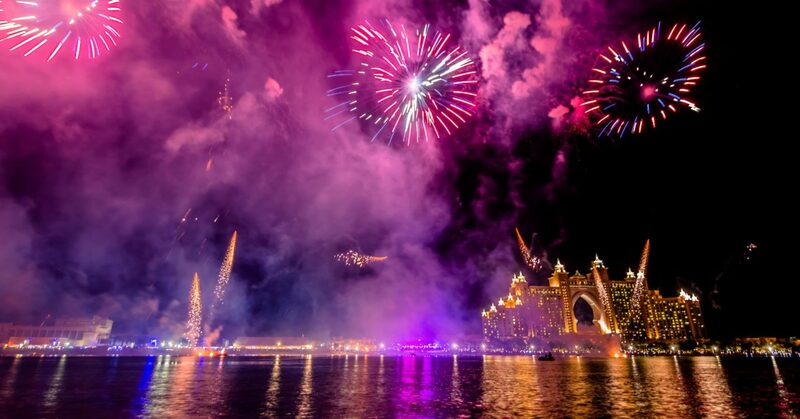 Guests dining at the above three restaurants (Nobu, Hakkasan and Ossiano) will also get front-row access to Atlantis’ jaw-dropping firework display. Held on the gala dinner deck, expect a complimentary open premium bar and bubbly ’till 3am. See ya in 2019! For reservations and more information, contact Atlantis restaurants on +971 4 426 2626 or message restaurantreservations@atlantisthepalm.com. nextFinally, a Gift Card that Can Be Used at ALL Popular Malls in the UAE!